This project kit was designed for Makerspace North; a mixed-use space that brands itself as an industrial workshop, start-up incubator, and community hub in Ottawa, Ontario. The proposal was to create a project kit for the community of fresh makers that found it difficult to engage with the technical proficiency of established projects. 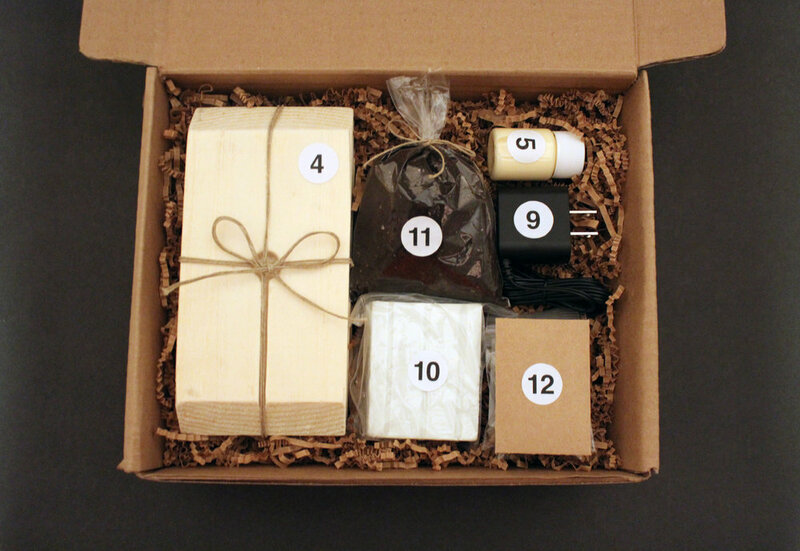 The maker kit aims to give buyers a hands-on introduction to the craft and technological processes of making while still prioritizing an attractive, usable end product. The maker experience was designed based on the methods and values of Makerspace North. 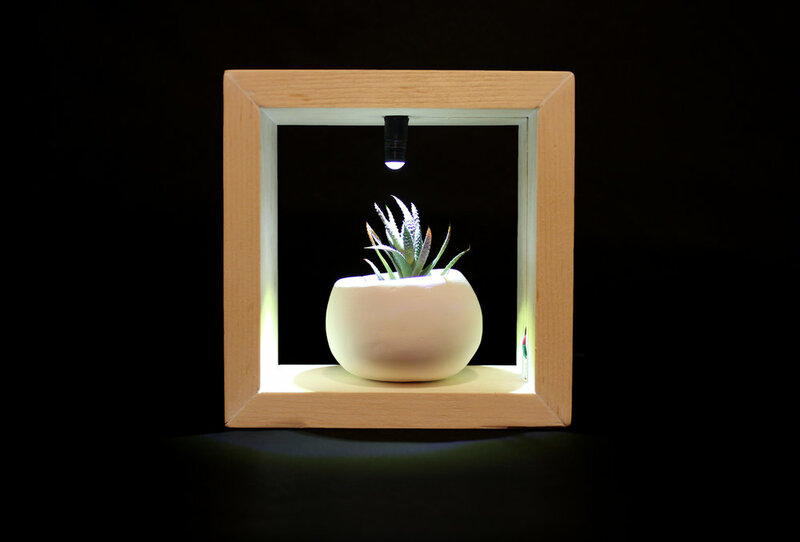 The kit includes the materials and instructions necessary to construct a frame suspended grow light and planter as well as to plant a haworthia succulent. The design will be handed-off to source and refine for commercial sale. A number label that corresponds with in-guide instructions was assigned to each component of the kit. The number indicates identification and procedure of use. Numbered order was determined by sequence of use in the making process. This feature was included to promote ease of use under all levels of experience. Adaptability allows the product to bypass the need for familiarity in areas of woodworking, electronic engineering, and sculpting to be more accessible to a broader consumer demographic. Assemble wooden frame : Glue L  and R side  pieces to bottom piece . Ensure that grooved indent of R piece runs upward. Glue top piece  onto side pieces with groove running right. Use wood glue  to secure connector  in hole on side of wooden frame. Connect wires from connector  to wires from LED socket  using electrical tape  : Twist exposed wires together then seal with electrical tape. Use hot glue to secure wires along grooved indent. Glue LED socket  into hole on top of frame. 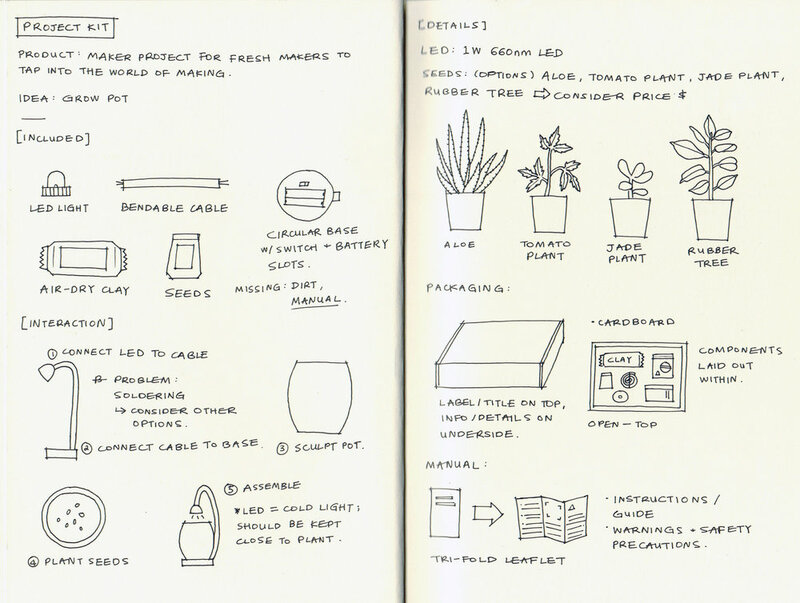 Construct a planter using clay . Bake for 30 minutes. Let cool. Plant seeds  : Fill planter with soil about 1 cm from the top. Press seeds into soil. Lightly cover with soil. Water with 1 tablespoon of water. Place planter beneath grow light.